The pest-control leader has benefited from a growth-by-acquisition strategy that's made it the industry leader. Few things can survive a nuclear holocaust, though one of them is said to be cockroaches. That hardiness -- coupled with humans' dislike of the critters -- means that Rollins (NYSE:ROL) should have plenty of business for a long time. So far, things are going according to plan, as sales for the owner of Orkin, Western Pest Services, and other pest control brands have grown 25% over the last five years, hitting $1.67 billion in 2017. Revenue was up another 9% over the first nine months of 2018, and strategic acquisitions continue to play an important role, allowing Rollins to operate in over 50 countries. With third-quarter earnings now out, let's look at whether the pest control leader has exterminated the doubts that have caused shares to pull back 11% from its 52-week high. Rollins has been sustained by rolling up the pest control industry under its roof, and that hasn't let up this year, as it has acquired OPC Services, Guardian Pest Control, and Aardwolf Pestkare, it's first entry into the Singapore market. A company can grow either organically or by making acquisitions. There's a lot to be said for each method, and companies many times try to do both, which is what Rollins is doing. Of the 6.4% revenue growth it achieved last year, 4.5% came organically, while acquisitions fueled the rest. In the most recent quarter, of the 8.3% increase in revenues, 3.2% came from acquisitions with the remaining growing organically. That's not a bad balance, but the growth-by-acquisition strategy is fraught with danger, as a company might acquire another that doesn't fit, or it might overpay. Consolidation in the industry has been heating up as Rollins has created incentives for rivals like ServiceMaster and Rentokil to also go on buying sprees, with U.K.-based Rentokil completing 41 acquisitions last year (33 in pest control alone) for 281 million pounds ($365.7 million). It's looking to spend another 200 million to 250 million pounds this year. ServiceMaster has completed over 100 acquisitions between 2013 and 2017. There can be good reasons to acquire a competitor, and so far Rollins has made compelling cases for the acquisitions it has made. But it bears watching because too often, serial acquirers turn into serial killers of investments. Because Rollins is the straw that stirs the drink in the pest control industry, it tends to carry a premium, and its enterprise value (EV) has typically hovered between 18 and 20 times its earnings before interest, taxes, depreciation, and amortization (EBITDA). 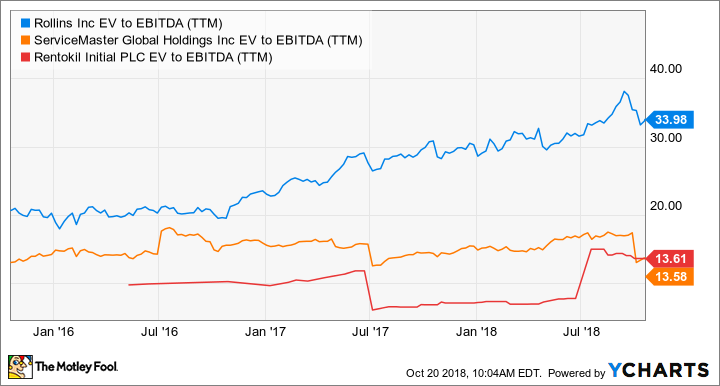 More recently, however, its value has soared and its EV-to-EBITDA is a tech-like 33 times. To put that in perspective, both ServiceMaster and Rentokil trade at a much more reasonable 13 times EV-to-EBITDA. ROL EV to EBITDA (TTM) data by YCharts. While Rollins also produces healthy free cash flow, its enterprise value trades at nosebleed valuations of 56 times its free cash flow. Rollins is a solid leader in the pest control industry, and analysts are forecasting earnings of $0.25 per share in the fourth quarter, a near-20% increase over the year-ago period, on an 8% increase in revenue to $448 million. While that seems in keeping with its performance over time, Rollins' stock price -- even at these levels incorporating the pullback it has experienced -- has all this growth potential baked in. Rollins would need to annihilate Wall Street's forecasts to justify its current prices. Although I like the pest control leader's business and positioning, it's difficult to support buying the stock at these levels.